Our Document of the Month for March is a record of the first Women’s Institute meeting to take place in Essex, which was in Broomfield, near Chelmsford, on 12 May 1917. Spying the piece we wrote about this record, one of our regular searchers, Pat Bruce, contacted us to say that her great-grandmother, Emily Crozier, had been one of the original members of the Broomfield WI in 1917, and that she had Emily’s original membership card, which she has kindly lent to us to add to our display. Emily Crozier’s membership card for the Broomfield Women’s Institute, 1917 (Temporary Accession 4346). The card includes the motto ‘To do all the good we can, in every way we can, to all the people we can; and above all to study household good in any work which makes for the betterment of our home, the advancement of our people, and the good of our country’. The logo at the top of the card is that of the Agricultural Organisation Society (AOS), which promoted the formation of Women’s Institutes during the First World War as part of its work to increase food production and save waste. The card is signed by Emily Crozier, and Dora M. Christy, the Secretary. Dora Mary Christie was described in her obituary in the Chelmsford Chronicle in 1947 as ‘a pioneer of the Women’s Institutes in Essex’. She was actively involved in the Essex WI from its earliest days, and was remembered as ‘a vital personality’, whose name ‘will be woven into the history of Women’s Institutes in Essex’. Along with Emily’s membership card, Pat has also lent us a photograph of the Broomfield WI. Emily is sitting in the front row second from left. Emily Crozier’s daughter Ethel was also a member joining in 1931 and her membership card, together with a programme for 1945, have also been lent to us. Ethel Crozier’s WI membership card, 1931 (Temporary Accession 4346). The motto by this time had altered slightly but maintained the same principle seen in 1917. An extract from the 1945 programme of the Broomfield WI, including on 7 March a talk from Antony Minoprio on the Chelmsford Area Planning Survey, which was a proposal to demolish most of the town centre. (Temporary Accession 4346). We thank Pat Bruce for loaning us this charming collection of records. They will be on display in our Searchroom alongside the Broomfield WI minute book for the rest of March 2017. 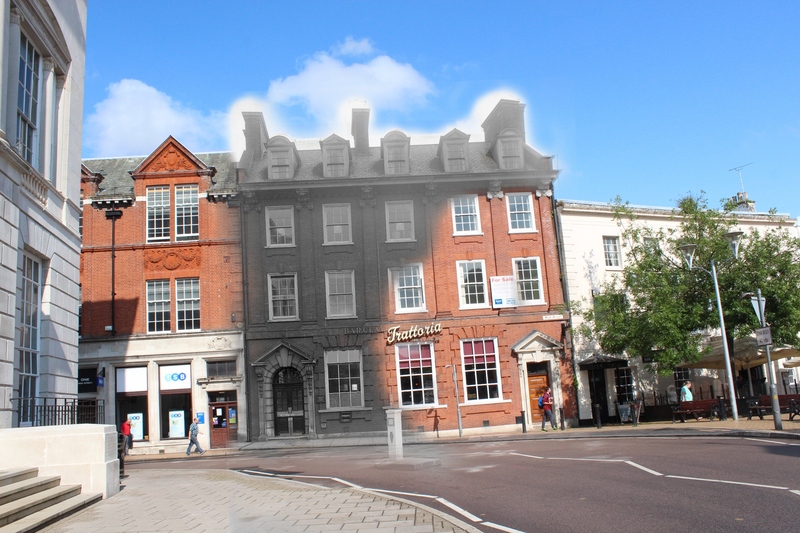 In our eleventh and penultimate post from our Chelmsford Then and Now project, Ashleigh Hudson explains how during her research project we compared historic photographs of Chelmsford High Street with today’s streetscape. Chelmsford is often (we think mistakenly!) viewed as having little in the way of historic character. We would argue that there are, in fact, as many examples of continuity as there are of change, and the key is to know where to look. One of the invaluable resources used during this project is the Spalding photographic collection of some 7,000 images. 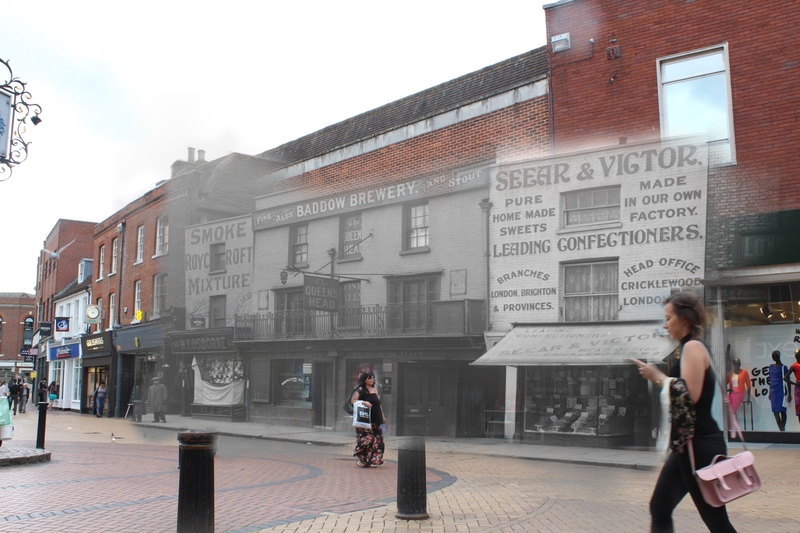 The Spalding family of photographers were based in Chelmsford High Street from the 1860s until the 1940s, and recorded how the street has changed over time. Fred Spalding senior was a self-taught photographer who set up the family business in Tindal Street in the mid-19th century. His young son, also called Fred, took a keen interest in his father’s business and quickly picked up the family trade. 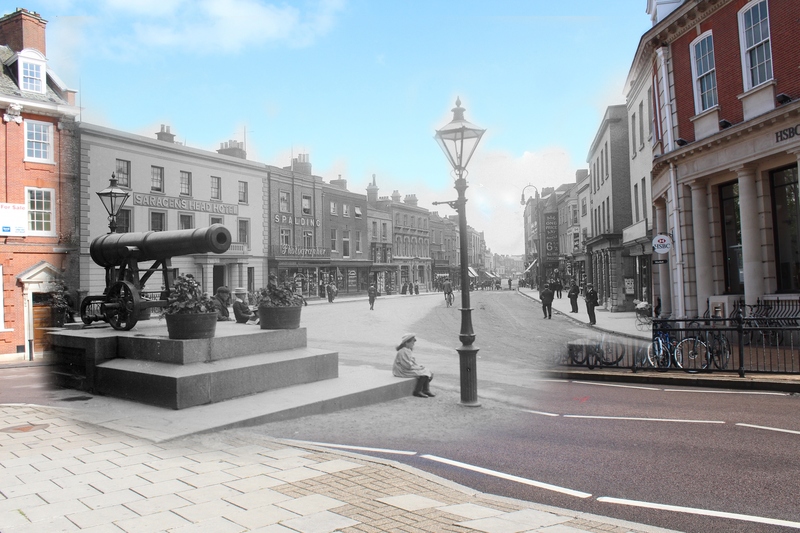 Several years later, an adult Fred relocated the thriving business to the site of 4-5 High Street (the current site of NatWest), where he established himself as the town’s ‘go-to’ photographer. 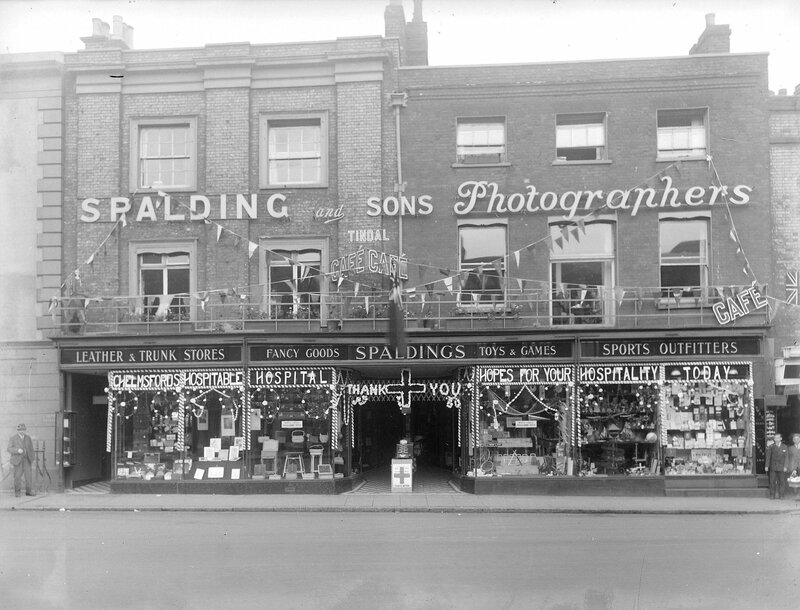 The Spalding family captured Chelmsford through time, and their legacy endures through their magnificent collection of images. You can read more about Fred Spalding and the Spalding shop here. 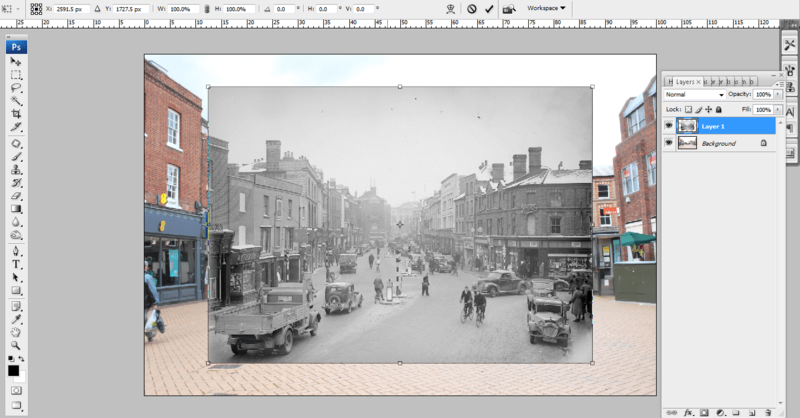 We have done our best to recreate some of the Spaldings’ classic shots of the High Street, taking a set of prints out with us and dodging showers to do replicate the original pictures as closely as we could. A quick comparison of some of the images revealed a high level of continuity across the upper half of most of the buildings. While the various owners and occupiers have changed over time, many of the architectural details have endured. The same building today. 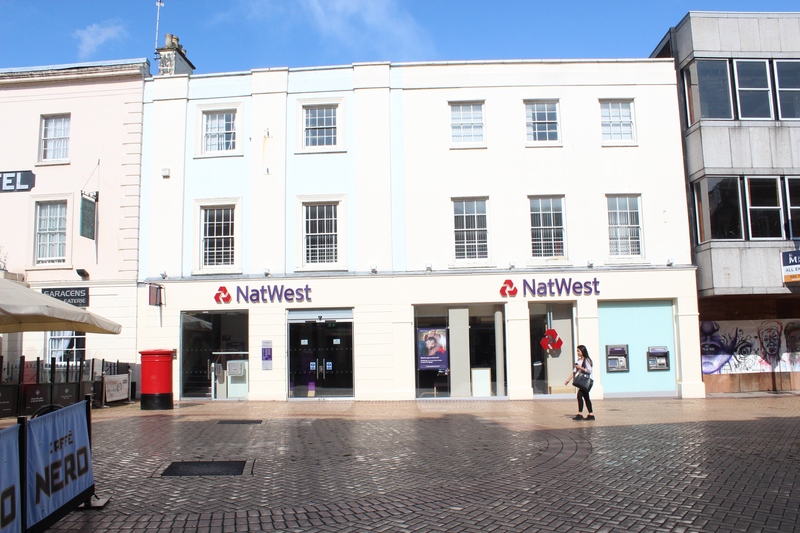 Beneath the layers of cream and pale blue paint, the upper exterior of NatWest is very much the same as when the building was occupied by Spalding. It was then possible to blend the Spalding image into the current photograph. A finished example of this process. 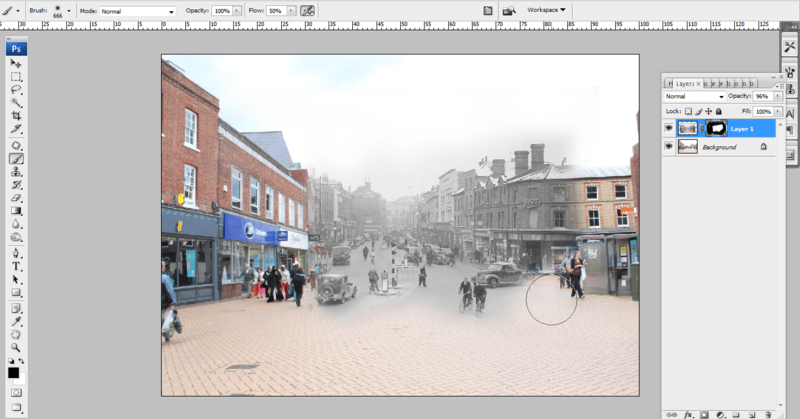 The edited image stretches down the high street, from the present day to the past. In some instances, such as with Jamie’s Trattoria/Barclays Bank (no.2 High Street), the level of continuity is striking. Barclays Bank c.1930 layered over the current occupier, Jamie’s Trattoria. In contrast, areas where entire stretches of the High Street were demolished and rebuilt, such as the sites of Paperchase and M&S (61-62 High Street), the edited images revealed how parts of the High Street are completely unrecognisable. You can see the final results of our image blending on our Historypin page, or you can visit the Searchroom to explore the full extent of the Spalding photographic collection. Our Document of the Month for March 2017 has been chosen by Archivist Katharine Schofield, who has selected the earliest record of the Women’s Institute in Essex, the minutes of the Broomfield WI who began meeting in May 1917. The Women’s Institute can trace its origins back to Ontario, Canada in 1897. In Britain the WI was created in part to cope with food shortages during the First World War and to help rural communities generally. The first British meeting was held in Anglesey in 1915. In Essex there were twenty-two WIs in existence by the end of 1917, with minutes surviving for the County Federation of Essex Women’s Institutes (Accession A8980 Box 1) and for the WIs at Broomfield (Accession A11304 Box 1), Epping (Accession A13888 Box 1) and Woodham Ferrers (Accession A11292 Box 39). The earliest record of a meeting was at Broomfield on 12 May 1917, followed by Woodham Ferrers on 6 June and Epping on 13 September. The WI was promoted by Mrs Alfred Watt, one of Canada’s first female university graduates. Madge Watt had been widowed and in 1913 came to Britain with the intention at least in part to establish the WI here. The First World War and the need for increased food production gave her the opportunity, working in partnership with the Agricultural Organisation Society (AOS). Mrs Watt and a representative from the Society toured the county addressing prospective groups. In April 1917 Mrs Watt spoke to a group of women at Chelmsford and presumably this inspired smaller groups to invite her to speak in their villages. She was too ill to attend the first meeting of the Broomfield WI so Mr Nicholson from the AOS spoke instead. It was proposed that a WI be started ‘to help food scarcity’, and Mr Nicholson described the WI as ‘a centre round which a group of women banded themselves together to help themselves and their country’. They would be able to do this ‘1st by releasing men from the land, 2nd by increasing food supply by cultivating vacant land, 3rd by preventing waste’. There would be co-operation in buying seeds, tools, cooking and preserving utensils. The WI also made war savings collections and helped village schools and industries. The meetings themselves offered women the opportunity to work on home-made clothing, see demonstrations and hear about keeping livestock, goats, bees, rabbits and poultry and conserving fruit and vegetables, as well as an opportunity to enjoy ‘the social element’. In Woodham Ferrers the rector had arranged the meeting and spoke about the ‘beneficial advantages’ before introducing Mrs Watt. By the time that the Epping WI was started the County Federation had been established and the speakers were Lady Petre and Mrs Watt. Most of these initial meetings were then given over to the practicalities of setting the group up and electing officers for future meetings. By 1917 there was an established national organisation to provide guidance, suggestions for talks and demonstrations, as well as supply badges and other items. Both Woodham Ferrers and Epping WIs purchased a book for their minutes stamped on the front ‘Agricultural Organisation Society’ at a cost of 6s. The first organised meeting of the Broomfield WI was held on 6 June. The minutes record that the first competition, making cakes or biscuits without flour, had ten entries with two prizes awarded and the first talk, arranged for the next meeting, was to be a demonstration of fruit bottling. The Epping WI talks for 1917 were on the subjects of ‘parcels for the Front’, sugar substitutes and the care of children in winter. The first competition in Epping was the best home-made Christmas gift, cost not to exceed 6d. At Epping there was some discussion about the membership fees ‘amongst the poorer people’ with a suggestion that these might be paid at a rate of 2d. per month. It was also agreed ‘by large majority’ that members could bring their children to meetings and that a volunteer would look after them in a separate room. Minutes from the second meeting of the Broomfield WI on 6 June 1917. A competition was held for baking cakes and biscuits without flour, and a demonstration of fruit bottling was organised for the next meeting. The singing of Jerusalem was not associated with the WI until the early 1920s, but the first meeting at Woodham Ferrers concluded with the singing of the National Anthem. In September the County Federation met for the first time at the Shire Hall in Chelmsford, with Lady Petre subsequently serving as the first president. The County Federation minutes record an organisation which grew rapidly from 1917. By the end of 1918 the number of groups in Essex had more than doubled. There had been classes on basket and glove making, boot mending, cobbling, rush work and straw plaiting, as well as lectures on housecraft, including mending leaks and repairing taps. The minutes of the first meeting of the Broomfield WI will be on display in the ERO Searchroom throughout March 2017.